Would you like the opportunity to win a one year subscription to The Essential Herbal Magazine? This magazine is written by, for, and about herbie people and the things they love. It is a grassroots publication that talks about the things you want to know when it comes to herbs. Susanna contributes an article to the magazine too. Beginning today Friday, February 27 through Thursday, March 5 you can enter to win by posting a comment in response to this blog entry and take a chance at winning a full year’s subscription to The Essential Herbal Magazine! (If you already subscribe to the magazine, the free year will be added to the end of your subscription.) Be sure to include an email addy in your comment so that we can reach you if you win! The following blogs are also participating. For additional chances to win and the chance to explore some really cool blogs, be sure to visit our herbal friends and leave a comment on their contest post. Comments for this post have been closed. 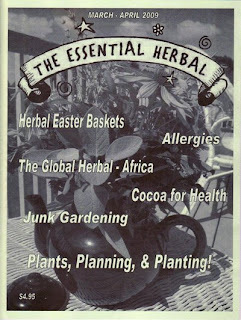 Congratulations to Kathi, Fairy Lover - she won the one-year subscription to The Essential Herba magazine! Thanks to everyone for participating. Some of you noticed that the 'Old Boy' was not on the Disney trip. No - too strenuous a journey, besides, his best buddy invited him to the Cabin in Perry County for the week. They headed to the cabin with a homemade carrot cake that I made before we left. Little did I know, carrot cake is the buddy's favorite cake! In appreciation, the boys found this beautiful sturdy Hall teapot at a local antique barn and gifted it to me as a thank-you for the cake. How fun is that! Better than any souvenir I found at Disney! This tea vendor was located in the Asian area of Animal Kingdom, close to the Expedition Everest ride where you board a high speed train with a caution to beware the Yeti (abominable snowman). Cedar would like to know more about the Yeti particularly the one that tore up the tracks on the Expedition Everest ride, causing us to ride the train backwards. He wasn't willing to ride the high-speed train a second time though to gather more information. Also in Animal Kingdom, this watering hole was tucked in the Maharajah Jungle Trek where you wander through the ruins of an ancient palace. Moving on to China, at Epcot, this vendor sold Strawberry Red Bean Ice Cream in addition to various teas. We tried the ice cream, interesting. Coming from dreary and grey Pennsylvania, it was so refreshing to see green grass, colorful flowers and blossoms on the trees. It was a magical place ~ everywhere you looked. There is an amazing attention to detail; wonders meet the eye at every turn and when we spotted a woman picking up trash on the muddy wet road in her high heels, it became obvious that everyone employed at the park is responsible for keeping it spotless. Quite a task when you consider the number of visitors every day, starting in the wee hours of the morning until the wee hours of the night. The park has 'extra hours' for guests staying at the Disney resorts. Magic Kingdom was open one evening from midnight until 3 am. No... we didn't make it during the extra hours that night. We do enjoy tea related things... and we stood in line to ride in the tea cups at Disney, or perhaps we just stood in line for the photo-op and the ride was a bonus. We divided into two groups with the boys in one cup, the girls in another, and spin we did! Stop by our gardens at The Rosemary House, and you'll find a big old orange and yellow tea cup long retired from a local amusement park. Guess it's a good thing they didn't have the coordinating tea pot at auction also! Unless it's a Disney character breakfast... which we did, on two mornings... once at the Grand Floridian with a quite grand buffet breakfast that even included candy and ice cream (it is a magical place after all) and again at the Polynesian Hotel where we were served family style at the table. 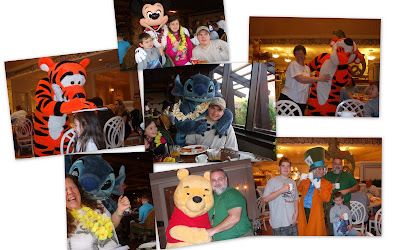 We had the opportunity to meet the Mad Hatter, Mary Poppins, Alice in Wonderland, Tigger, and Winnie the Pooh at our first breakfast; and at the Polynesian, we were greeted by Mickey, Pluto, Lilo and Stitch. What fun! As you can see - some were real characters! We're off on another family adventure, no wagons this time, no roughing it! Just high tech action and adventure at Disney World. We'll share more when we return! Talk to you soon! Sit back, relax, and enjoy a special Valentine's Day Tea prepared just for you! The bottom tier holds the sandwiches which include Heart's Delight Tomato Aspic and Cucumber Rounds, You Warm My Heart Ham and Cheese Domino Sandwich, Cupid's Fruit Cornucopia on Raisin Bread, and a Sweet and Savory Heart Shaped Sandwich on pumpernickel. The Scones include The Queen of Heart's English Cream Scones and Love Me Tender Cherry Scones with fresh fruit. The top tier holds the desserts which included a Cherry Cheesecake, I Love You Berry Much heart shaped cookie, a Hugs and Kisses macaroon cookie, and petite heart shaped DreamMint candies. Roses are Red, Violets are Blue, this Special Tea Tray was Made Just for You. What an exciting adventure this has been! With just shy of 1000 participants, One World One Heart has created a circle of hands around the globe.... we were pleased to meet many new friends and welcome so many kind visitors to our blog. This endeavor has introduced us to many inspiring artists, many creative and clever participants, and indeed made the world a smaller place. 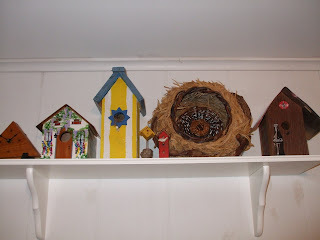 Over 200 visitors posted comments to our blog, and we would like to thank each and every one of you for your kind words! Today, it is our pleasure to announce Barbara Will as the winning entry in our One World One Heart Giveaway. Congratulations Barb! Please confirm your mailing address by contacting us, and we will send the afghan and cookbook to you. Enjoy! Setting a special table for a Valentines gathering? Why not try your hand at folding a heart shaped napkin. Easy enough to do, showy enough to look like you took all day preparing the napkins, cute enough that the 9 year old at the table doesn't want to 'unfold' the heart. Every Valentine's Day, this quick and easy cake is served to family and friends. The sharp contrast of the beautiful red cherries against the rich white frosting is just striking. Named Cheery Cherry Cake, it is suitable for Valentine's Day or President's Day! To make this cake, simply prepare your favorite white cake in either heart shaped pans or round layer pans. While the cake is cooling, prepare the frosting. Mix Crisco and margarine, cream well. Add milk, vanilla and sugar. Beat together for approx. 5 minutes. Frost cake. With remaining frosting, pipe shells around the bottom and top edge of cake. Chill. Just prior to serving, top with a can of cherry pie filling. May I cut you a piece? 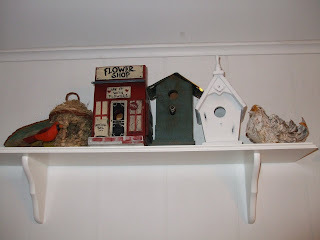 Having saved all the Valentine boxes from years past, we now have instant decoration for the tea room. 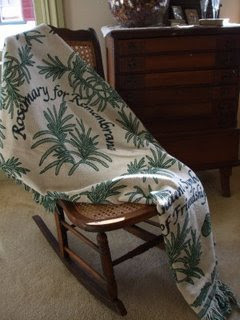 Tuck a heart in every possible corner, and the tea room (or your home) will look festive and dressed for the occasion. It's a quick, easy decoration, rather frugal, even green, 'er red. We're beginning to think Valentine's Day around here, and this plate full of tempting desserts was the top tier of the three tiered tray for SereniTEA Wednesday last week. It included miniature carrot cake muffins with cream cheese frosting and tiny red candy hearts. There was also a petite cheesecake topped with fresh raspberries and berry glaze. In the center were Easy Caramel Turtles. The recipe for these quick little morsels was shared by Suzanne at Pink Roses last week. Place pretzels on a cookie sheet. Top with unwrapped Rolo candy. Heat about 2 to 3 minutes in a 250 degree oven, until chocolate softens. Remove from oven, press pecan half on top of chocolate. Allow to cook before removing from tray. Store in tightly covered tin. Share with family and friends if you must. This Red Rose Tea Cup of Fortune is available for sale in The Rosemary House. It's English Bone china by Taylor & Kent with markings on the bottom of the cup and saucer. There are unique symbols on the cup and saucer to aide in your own interpretation of the tea leaves. Lion, star, rose, bird, house and more, it is a good beginning for your own tea leaf reading collection. Contact Susanna if you are interested in the cup, $21.95 postage paid. Tea Cup Tales, Tales of tea and how to read tea leaves by Margaret Lange McWhorter, was published in 1984 by Ransom Hill Press. The Table of Contents include tea cups secrets, setting the state, the equipment, brewing the tea, reading the cup, symbols and sources, predictions, rules, and more! With regard to selecting the tea, according to the author, black teas are usually the easiest to read. It must be black tea though. Green tea is difficult to read as the leaves are so large they fill the cup. A tea bag broken open is one of the worst choices as the leaves are fine and powdery thus causing the symbols to be blurry. Herb teas can be read the same as other teas, however, if the leaves are very large, it is suggested you crumble them between your fingers before brewing. The author provides 9 sample cups that you can use to practice your interpretation. She confirms that you might not see what she sees, but reinforces that the idea is to see something and then interpret what you see. The reading must come from within you. The second booklet, the magic in tea leaves, or how to read the future in tea leaves by Amber McCarroll was first published by the Tea Council in Great Britain in 2004 and is dedicated to all children who love tea parties. The contents include preparing the cup, reading tea bags, tea tray for a reading, ritual of tea trays, types of tea trays, symbols and their meanings, and flower-lore. This is the first book that actually uses tea-bag tea and incorporates it into the procedure. This is the first book that incorporates flowers and flower lore into the book. She suggests adding the flowers in a stem vase and placing them on the tea tray as they are such an important part of the pleasure of the tea ceremony. This well packaged tea cup and book, labeled A traditional fortune-teller's cup and saucer plus illustrated book of interpretations, was available for purchase in Barnes & Noble bookstores in 2000. The text copyright belongs to Jane Lyle, the cup and saucer design copyright is Eddison Sadd Editions with Aynsley China Limited 2000. The book is divided into three parts. Part One is How to Make a Reading, Part Two is Reading the Signs, and Part Three are Sample Readings. The author claims tea leaf reading is whimsical, yet effective. Fascinating, with a blend of mystery and a generous helping of common sense. Deceptively simple, yet utterly magical. Personally, looking at some of the symbols, there is a certain amount of imagination that needs to be utilized in addition to the interpretation. May you always find fortune in your cup. These two little booklets are from the 1930's. The smallest one, 'Your Future in Tea Leaves' was easily obtained by sending a label from any package of orange pekoe tea, any brand, to the Tea Market Expansion Bureau in NYC and boldly proclaims 'telling fortunes with tea leaves is Fun and wins friends!' If you learn this skill, you will be sought after at parties, and everyone will envy you your talent. The booklet features a list of symbols and their interpretation. It does caution that if the tea leaves in the cup appear all muddled together, it signifies that you are not in the mood for tea leaf reading, and that you should try later. The Cup Reading booklet, The Ancient Art of Foretelling the Future, was distributed with compliments of the Salada Tea Company. The tea that comes to you "fresh from the gardens". With many references to Salada Tea, it includes the proper way to make good tea. It also provides instruction on preparing the cup for tea leaf reading, directions on studying the cup, and reading the symbols. It includes a handy index to common symbols; some of which include a bear (long journey), birds (good luck), clouds (success), horse (fulfillment of ambitions), ring (marriage), star (wealth, happiness), and triangle (luck, unexpected inheritance). This informative book by William W. Hewitt was published in 1998 by Llewellyn Publications in St. Paul, MN. It is a complete guide to reading and interpreting tea leaves. This book is divided into several sections which include the philosophy of tea leaf reading, how to prepare the cup, how to analyze and read the tea leaf symbols, how to interpret the symbols, and also provides a glossary of symbols. This illustrated glossary contains more than 400 symbols, and also differentiates the 'zones' of the teacup. It will guide you through the interpretation of tea leaves, an airplane might mean you are going on a long journey whereas a hat would signify added responsibilities at work. Hills signify spiritual growth, but a shoe means that you are going to have to increase your effort if you want to achieve your goals. Reach for the stars as a star is the cardinal symbol of success. It is one of the most powerful of all symbols. It's not unusual to see at least a dozen symbols in a cup. Each one, left to your own interpretation. Tasseography, or the art of reading tea leaves, is the interpretation of the tea leaves that remain in the cup after drinking a cup of tea. This unique method of telling the future has been utilized throughout the ages with tea leaf reading considered the most popular for a number of centuries. Many books and pamphlets have been printed about this process. This Taltos Fortune Telling Teacup, marketed in 1970, was one of the gift items sold in The Rosemary House. The symbols of the Zodiac grace the plate and the inside of the cup. The writing around the side of the teacup reads, Would'st thy fortune like to see? Perchance this cup will show it thee. On the bottom, it is marked Made in Japan, Fine china, International Collector's Guild. The book that accompanies the teacup includes directions for the Reading, with the "reader" named as the person telling the fortune, and the "inquirer" is the one whose fortune is being told. In the introduction, it states that this teacup will provide an amusing pastime for those who enjoy a cup of tea with their friends. Is also cautions that not all of the predictions will come true, and that it should be considered a source of amusement and entertainment, and not to take the predictions too seriously. The process includes drinking a cup of small, loose, leaf tea,but leaving about a teaspoonful of tea in the bottom of the cup. With the cup in the right hand, swish the tea leaves around three times in an anti-clockwise direction. Then turn the cup into the sauce and allow it to drain. The reader will pick up the empty cup and study the position of the tea leaves and determine the images that have been created from the leaves. These images are then interpreted and utilized to tell the fortune. The events that are nearest to the rim of the teacup will occur in the near future. The further the tea leaves are from the rim, the more distant in the future it will happen. Please join us tomorrow as we continue our journey into fortune telling thru tea leaves.